I took eight of my rats to help with a rat promotion stand at the National Exhibition Centre last Saturday. 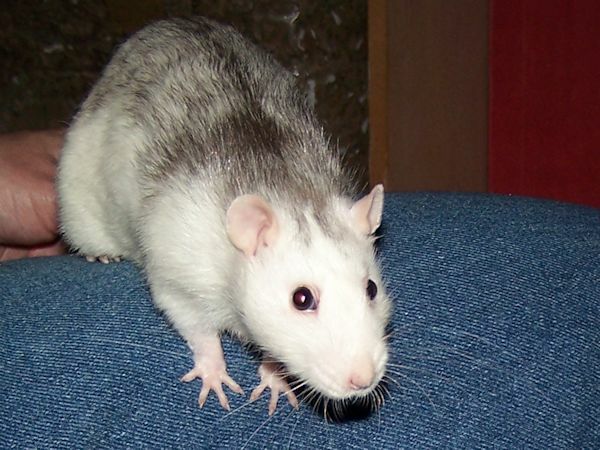 We saw an incredible number of people, many of whom had had rats in the past or were considering them as pets. The idea was to offer people the opportunity to stroke or even hold a rat, so we all took as many rats along as possible because they do get very tired at these events. 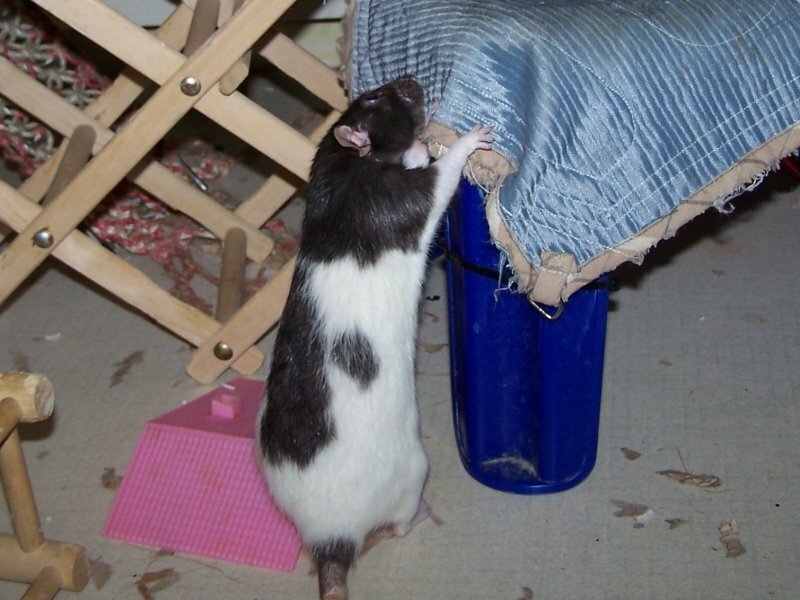 Six of my rats took it fairly well, they allowed the visitors to stroke or hold them, but they were glad to return to their cage. Hickory didn’t get taken out much because he was determined to get onto the floor, which I didn’t feel was such a great idea. The big surprise was my one year old blue agouti boy, Grundy. He decided it was his mission to visit every shoulder in the building. People only had to put their arm out to stroke him and he was suddenly sitting on their shoulder. Several times he shoulder surfed from person to person, making it hard to keep track of him. Somehow he must have known which people to trust, because not once did he cross to someone who panicked at his presence. He even made a couple of fairly long jumps to reach his targets. It was a complete revelation to me to see this side of his character and he spend most of the day out meeting people, hiding in the rat pouch when he had had enough but then emerging again when he realised I was talking to someone new that needed to be ratified. I’m so glad I chose his group to take along. Ratty Corner has finally crept into the 21st Century with a webcam streaming via Youtube to replace the frame by frame broadcast I had before. This was brought on by wanting to show everyone our latest litter of baby rats, who are 18 days old today. So, yesterday’s trial of the Amazon giveaway showed me that my expectations were far too low. I set it to give a free book to every tenth person, with three books available. It sat there all afternoon (UK time) until I put it on twitter, whereupon all three books went within twenty minutes even though I didn’t use the giveaway hashtag. It made no noticeable difference to the sales of Simply Snowflakes, but it did mean that I had some .com sales to give my book a ranking, albeit I was the one who bought the books. Today I thought rather than try it with a book that isn’t selling, I would try it with my best .com seller, the Fanciful Rats book. I’ve set the odds of winning far higher, just to see what happens, but there are five books on offer. I’ll probably tweet it directly this evening, but for now I’m just putting it here. Here goes. We went to our local rat show last Sunday. It was the club’s 14th birthday, and I’ve been going to the shows almost from the beginning. 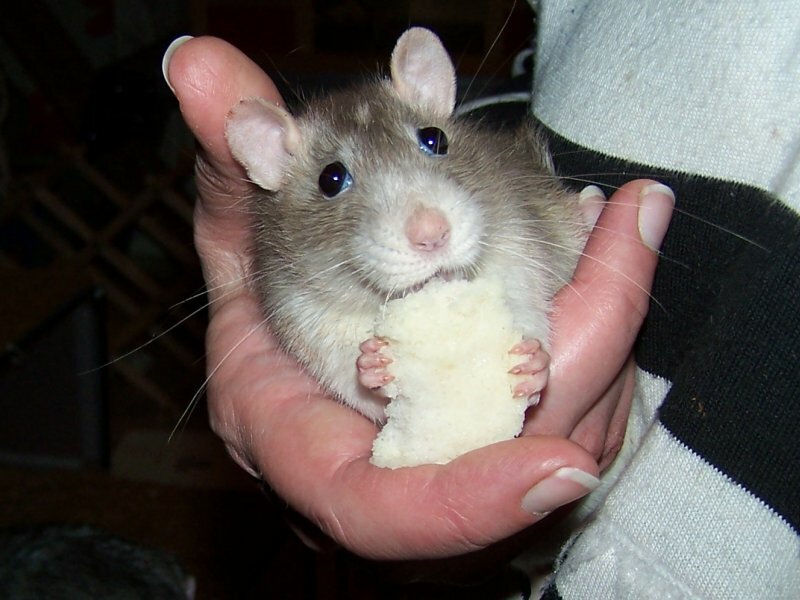 The Midlands Rat Club is a very pet oriented and family friendly club, but we do enjoy showing our rats as well. It’s taken me a few days to arrange all the photos for the club website, but I think they’re all in now. I’ve also put together a video of the show. This is Mr Pickles. He’s a rehome boy whom I’ve had just over a year. I was told he was a year old when I had him, but I estimated him at around nine months as his roaning hadn’t faded much. One year later and he’s still not as faded as you’d expect. He was very odd and ‘broken’ when he came, and I scared him into a relapse a few months after then by moving his group into a different cage, but he seems to have mended completely now and has recently coped with baby intros and a cage move very well. I forgot to post Whimsy’s photo last night. She’s a black hooded doe from Kirkby Pet Welfare, and is two years old. She has a permanent head tilt from a previous ear infection, but that doesn’t slow her down at all. This is Verity. She’s a Russian blue agouti Essex and is 25 months old. She’s great granny to the recent babies, and she’s quite fond of a chunk of bread.